A transistor is a solid-state electronic device used to control the flow of an electric current. The term solid-state refers to devices that take advantage of special properties of solids. (It usually refers to devices made of semiconducting materials.) Since they were invented in the 1940s, transistors have come to revolutionize modern communications. They are found in an enormous variety of electrical devices, ranging from popular consumer items such as home computer games, pocket calculators, and portable stereos to the complex electronic systems used by business and industry. Until World War II (1939–45), most systems of communication used vacuum tubes for the amplification and control of electrical current. However, vacuum tubes have a number of serious disadvantages. They are bulky and fragile, they consume a lot of power, and they have a tendency to overheat. The demands of radar in particular during the war encouraged scientists to look for another method of amplifying and controlling electric current in communication devices. The discovery of the transistor was announced in 1948 by three scientists from the Bell Telephone Laboratories: William Shockley (1910–1989), John Bardeen (1908–1991), and Walter Brattain (1902–1987). The key to this discovery is a class of materials known as semiconductors. Semiconductors are substances that conduct an electric current only very poorly. They fall somewhere between true conductors (such as silver, aluminum, and copper) and nonconductors (such as wool, cotton, paper, air, wood, and most plastics). The two most commonly used semiconducting elements are silicon and germanium. Some important semiconducting compounds include cadmium selenide, cadmium telluride, and gallium arsenide. Semiconductors fall into one of two general categories: n-type semiconductors and p-type semiconductors. The former class consists of materials that have a slight excess of electrons, while those in the latter class have a slight deficiency of electrons. Amplification: Increasing the strength of some signal such as the amount of electrical current passing through a transistor. Base: The middle slice of a transistor. Chip: The piece of semiconducting material on which integrated circuits are etched. Collector: One of the outer slices of a transistor. Dopant: An impurity added to a semiconducting material. Doping: The act of adding impurities to change semiconductor properties. 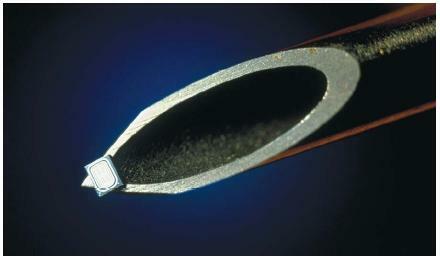 Emitter: One of the outer slices of a transistor. Integrated circuit (IC): An electronic device that contains thousands or millions of microscopic-sized transistors etched on a single piece (chip) of material. N-type semiconductor: An element or compound that has a slight excess of electrons. P-type semiconductor: An element or compound that has a slight deficiency of electrons. Resistor: Component used to introduce resistance. Semiconductor: A substance that conducts an electric current—but only very poorly. Solid-state: A term used for electronic devices that take advantage of special properties of solids. It usually refers to devices made of semiconducting materials. The conductivity of both n-type and p-type semiconductors can be enhanced greatly by adding very small amounts of impurities. This process is known as doping and involves the addition of roughly one atom of dopant (such as boron or phosphorus) for each ten million atoms of the base semiconductor (such as silicon or germanium). A typical transistor looks like a sandwich with one type of semiconductor as the slices of bread and the second type of semiconductor as the filling. For example, a thin slice of a p-type semiconductor might be placed between two thicker slices of an n-type semiconductor. The middle slice of the transistor is known as the base, while the two outer slices are called the collector and the emitter. Suppose that this transistor is placed into an electric circuit, and current is allowed to flow through it. The current flows into the transistor through the collector, across the base, and out through the emitter. The flow of this current can be controlled by attaching a second source of electric current to the base itself. The amount of current that flows through the transistor will be determined by this second source of electric current. If a relatively small current is allowed to flow into the base, the transistor does not permit a very large flow of current through it. If a relatively large current is allowed to flow into the base, the transistor allows a much larger flow of current through it. amount. That small increase will allow a much larger flow of electric current—say up to 2.5 milliamperes—through it. The transistor has been made to act, therefore, like an amplifier. Many other kinds of transistors have been developed to perform other electronic functions. One of the greatest breakthroughs in transistor research was the invention in 1959 of the integrated circuit (IC). An integrated circuit is an electronic device that contains large numbers (usually thousands or millions) of microscopic-sized transistors etched on a single piece (chip) of material.